Some athletes undergo Intermittent Hypoxic Training (IHT) to enhance their performance in sports settings. It is non-invasive and drug free. 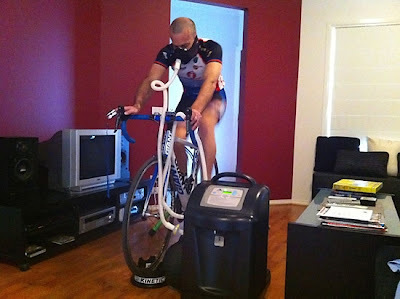 IHT is a type of therapy where the person trains in low oxygen conditions. This can be acheived thru the use of a mask-based hypoxicator system. The mask based hypoxicator keeps the barometric pressure the same while the oxygen content is reduced which also reduces the partial pressure of oxygen. Aside from using masks, a natural and common practice for IHT is exercising and training in high altitude areas since these areas have decreased levels of oxygen compared to low level areas. There are also artificial chambers that simulate these conditions. Now, a new study finds that exercising in low oxygen environment may result in improved insulin sensitivity. Intermittent exercise with and without low oxygen concentrations (or hypoxia) can improve insulin sensitivity in type 2 diabetics, however exercise while under hypoxic conditions provides greater improvements in glycemic control than intermittent exercise alone, according to a recent study accepted for publication in The Endocrine Society's Journal of Clinical Endocrinology & Metabolism (JCEM). Type 2 diabetes, the most common form of diabetes, is where the fat, liver, and muscle cells do not react correctly to insulin (insulin resistance). As a result of this, blood sugar does not get into these cells to be stored for energy. Exercise improves glycemic control in patients with type 2 diabetes. Previous studies have focused on continuous aerobic exercise with more recent work assessing resistance exercise. There are few studies that assess the effects of intermittent exercise on glucose tolerance and insulin sensitivity in type 2 diabetes. "Current guidelines suggest that health benefits can be gained when patients with type 2 diabetes spend 30 minutes exercising each day, but published data has failed to show intermittent exercise to be effective," said Richard Mackenzie, PhD, of the University of Westminster in London, U.K., and lead author of the study. "Here we have shown that intermittent exercise seems to improve the glucose profiles of type 2 diabetics with a greater positive effect when intermittent exercise is combined with mild hypoxia, similar to doing the exercise at altitudes of 2500 meters." In this study, eight men with type 2 diabetes completed three exercise trials: 60 minutes of continuous exercise in hypoxia, intermittent exercise in hypoxia and intermittent exercise in a normal oxygen environment. After each exercise trial, study participants returned to the laboratory for measurement of blood glucose and plasma insulin levels. Researchers found that both intermittent and continuous exercise with and without hypoxia consistently demonstrated improvements in insulin sensitivity. "A combination of moderately reduced oxygen levels with exercise can significantly improve the body's ability to respond to insulin in type 2 diabetic patients over exercise alone," said Dr. Mackenzie. "Our findings suggest the possible use of exercise with mild hypoxic for the treatment of type 2 diabetes."